Style → General → Measure allows you to adjust the distance between various items within measures. 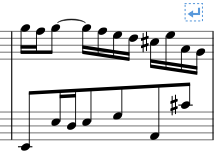 If you change a measure style property (see image above), MuseScore automatically adjusts the score to maintain the correct spacing between notes and rests according to best music engraving practice. It will also correctly reposition any elements attached to notes or rests, such as fingerings, dynamics, lines etc. Sets the minimum horizontal length of measures. In measures containing very little content (e.g., a single whole note or whole measure rest), the measure will only shrink as far as this minimum. Condenses or expands the space after notes or rests. This setting thus affects not only space between notes but also between the last note and the ending barline. For the space between the beginning of the measure and the first note or rest, see Barline to note distance (below). Note: Changes to an individual measure's Stretch (under Layout → Increase Stretch, Decrease Stretch) are calculated after, and proportional to, the global Spacing setting. Sets the distance between the barline which begins a measure and the first note or rest in that measure. For the initial measures of systems, which start with clefs instead of barlines, use Clef/key right margin (below). Sets the distance between a barline and a grace note that occurs before the first actual note in a measure (independently of the "Barline to note distance" setting). Sets the distance between a barline and an accidental placed before the first note in a measure (independently of the "Barline to note distance" setting). Specifies the smallest amount of space MuseScore will allow after each note (depending on other factors, more space may be allowed). Sets the distance between the key signature and the clef preceding it. Sets the distance between the time signature and the key signature or clef preceding it. Sets the distance between a barline and a clef change preceding it. Sets the distance between a multi-measure rest and the barlines on either side. Sets the thickness of the lines of the staff, which allows you to make the staff thicker and darker, if you need greater visibility on your printouts. Here you can select the paper format, either by standard name (e.g., Letter or A4), or by specifying the height and width in either mm or inches (use the radio buttons to choose which unit of measurement to use). The initial default page size depends on your localization—in the United States, Letter size paper is standard. You can also choose to format your music in Landscape or Portrait orientation using the radio buttons. Prior to version 2.1 unchecking Landscape enabled Portrait format. You can optionally use Two sided layout (i.e., book format, with mirror left and right margins for even and odd pages—see below). 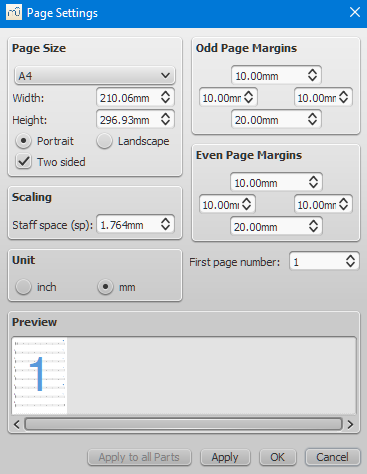 The Even Page Margins and Odd Page Margins settings allow you to define the printable area of your pages. 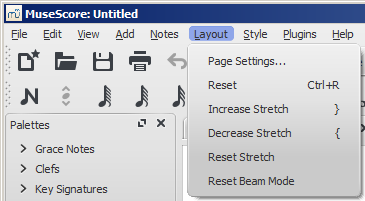 Aside from changing the margins around the music on the page, other settings, such as the positions of headers and footers, are calculated relative to the margins defined here. 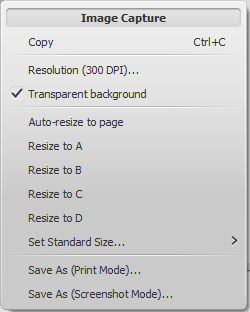 If the "Two sided" checkbox under "Page Size" is selected, you can set margins differently for mirroring odd and even pages. Otherwise, only one set of margins can be modified, but will apply to all pages. To display page margins in your score on screen (though not in print), go to View→Show Page Margins. The Scaling property allows you to increase or decrease the size of your score. In MuseScore, the sizes of score elements, such as note heads, note stems, accidentals, clefs etc., are defined in terms of a unit of measurement called a staff space (abbreviated to "sp"). 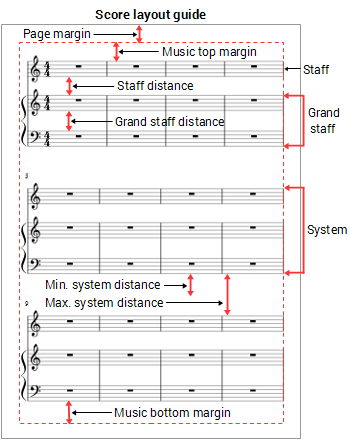 One staff space is equal to the space between two lines of a music staff (or one-quarter the size of the full five-line staff). As you change the "Staff space" setting (under Scaling), all score elements follow suit and thus correct proportions are maintained. The exception is Text in which you can set an absolute value, independent of "Scaling." Note: Changing the "Scaling" does not always change the number of systems per page, because system distance can vary between limits set under "Min system distance" and "Max system distance" (see Style→General...→Page). Sets the number of the first page of the particular score. Page numbers below 1 won't get printed—e.g., setting the first page number to -1 would result in the first and second page showing no page number, and page number 1 appearing on the third page. The Apply to all Parts button is available when modifying a part, rather than the main score (see Part extraction). If you change the page settings of one part and want the rest of the parts to have the same settings, this button will apply the change to all parts in one go.